Joseph's birth and death dates (born 19 March 1751 and died 10 June 1817) came from the Official Roster of the Soldiers of the American Revolution Buried in Ohio, Vol. 1 (published 1929) (no source for these dates is listed). Joseph's will is dated 9 July 1814 and the date of probate was 7 March 1815. His pension records also say 1815. This story we have of Joseph's birth, emigration, marriage, and military service are from his great-grandson, Eli W.J. Lindesmith. It is based on family tradition and he probably heard it from his father, who was actually raised by Joseph Lindesmith. However, there is no hard evidence that can back up much of the information (and maybe there never will be). Please be aware: his birthdate, death date, parents' names, immigration date and information, wife's maiden name, and military service are unproved. My comments are in brackets [ ]. Johannes Lindenschmied christened May 26, 1751 (Wed) in Evangelisch (Reformed) Church, Hassloch, Rheinland-Pfalz, Bavaria. Parents: Friederich Lindenschmied & Elisabetha. [Listed in “Germany, Births and Baptisms, 1558-1898" at familysearch.org (the 12th record). The year of birth is the same. There were lots of Lindenschmidt family in the town of Hassloch and a few towns around. It would make sense that he was born Mar 19 and christened May 26 as many children were christened within a few days of their birth. Problem is the birth record doesn't say "Joseph." Friederich, however, was the son of Daniel and his first wife, Anna Barbara Muschel. According to a ship record, Friedrich came to America with Daniel and his 2nd wife in1748. He must have gone back to Germany. He (Joseph) was the son of Daniel Lindesmith & Elizabeth Bernard. * In 1769, at the age of 18, he came to America with his guardian. On Ascension Day in 1769 [Easter was March 26 that year; Ascension Day is 39 days later, making it May 4] they arrived at Hagerstown, Washington Co., Maryland, where he settled. Joseph's brothers George, Michael and Jacob came with him. [It seems likely that Joseph came to America to live with his grandfather in 1769. His grandfather, Daniel, left for America in 1748 with his 2nd wife before Joseph was born though. Daniel had sons Jacob and George with his 2nd wife. No Michael that I can find. It's also interesting that Joseph came to America, age 18, with a guardian -- not sure who that would have been. At some time, Joseph became an apprentice to a joiner (carpenter) and he also learned the fanning mill trade which he used the rest of his life. Many of the old farmers in Hanover, Center & other townships in Columbiana County, Ohio had fanning mills made by Joseph. These mills had no nails or screws in them. They were all made of wood except part of the crank and the wire sieves. [Perhaps Joseph's mill was an early version. Fanning mills were first built in 1786 in England, the fanning mill (or winnowing machine which separates the wheat from the chaff) was a square or rectangular shaped box with a crank handle on the outside and two sieves and a paddle wheel on the inside. When the handle is cranked the paddle wheel rotates creating an artificial breeze while the sieves rock from side to side. Grain is dumped into the fanning mill from the top and the chaff is blown out the front by the artificial breeze created by the paddle wheel. The grain works through the sieves and comes out of the machine into a bucket on the ground. Many farmers used thresher-separators by 1875 to thresh and clean grain, but kept fanning mills to “super clean” the grain before planting.] . . . . . .
Nancy was born Feb 21, 1752 and raised near Philadelphia. She could read & write German but could only speak English. Joseph, by self-study, learned to speak, read & write English. Their first son, Daniel [probably named for one or both of his grandfathers], was born in Guilford in 1773. EWJ Lindesmith said that Joseph had 3 brothers: Michael, Jacob and George. Birth records show sons of Johan Daniel Lindenschmidt and Anna Catherina as: Johannes (b 1747 Hassloch, Germany), Johan Jacob (b 1750 Lancaster Co, PA), and Johan George (b 1753 Lancaster Co, PA). No Michael, but perhaps he was Johannes Michael. If Joseph is the grandson of Johan Daniel, then these 3 men were his uncles. Johan Daniel died in 1760, but Joseph didn't come to America until 1769. On Sept 9, 1774 Joseph, Nancy & new baby Daniel moved to Brothers Valley near Berlin, Pa. [The area Joseph moved to (abt 50 miles SE of Pittsburg) was called “The Glades” at that time, in Brothersvalley township, Bedford Co. Brothersvalley township comprised all of what is now Somerset Co. (it was in Bedford Co. from 1771 until 1795 when it became Somerset Co). Brothers Valley was founded in the 1760's, incorporated in 1771. Lots of Amish lived in the Glades of Brothers Valley (which was immediately north of Berlin, Pa). The Amish were involved in intense evangelism during the Second Great Awakening, 1785-1800 (from: The Berlin Area 1777-1977, pp 125-130). At the beginning of the Revolutionary War Joseph enlisted, first for 6 months, then for the entire war. He served as a bugler & fifer and bore arms for 7 years in the Revolutionary War and also served as George Washington's barber, frequently shaving him. [#28-see source list at end] He was present at General Cornwallis’ surrender to General Washington at the end of the War, Oct 19, 1781 at Yorktown, Va. [It is interesting to know that the song "Yankee Doodle" was created by the British and sung to mock the American soldiers beginning during the French and Indian Wars (1755) and continued throughout the Revolution. However, by the time the Revolutionary War was over the Americans were also singing the little ditty. After the battle at Yorktown, the American soldiers sang "Yankee Doodle" while they made the defeated British soldiers march out of their fort past them and lay down their guns!] Nancy did the farming during the War. Next door was John Kniper who was probably the future father-in-law of Joseph's daughter Elizabeth. John Knepper was made a deacon in the (Reformed & Lutheran) church Apr 14, 1792. In 1791 congress approved a tax on whiskey to help pay off the national debt. This hit farmers all along the frontier very hard because they had very little cash and they usually turned left-over grain into whiskey. They organized to protest and resist the tax and by 1794 the movement had become what is now known as the Whiskey Rebellion. Washington and Hamilton decided to make Pennsylvania an example of federal authority and they assembled an army and marched to Bedford Co, where Washington had his headquarters, then on to western Pennsylvania. They arrested a few and tried and pardoned a couple of men. In 1803 the hated law, which was largely unenforceable, was repealed. Nancy Lindensmithen, William Knepper (who m. Elizabeth Lindesmith), John Knepper (his brother), Ludwick Smith, Henry Boyer, Michael Boyer (John Lindesmith m. a Boyer girl). In the 1800 census they were living in Brothersvalley Township in Somerset County, Pennsylvania. This area had been settled not long before 1774 when Joseph moved there. Lots of Germans lived here. Somerset County highlighted at right. John (April 21, 1799), Peter (May 11, 1806, the same day as Maria Lindeschmidt - relationship unknown - maybe a cousin). All these church records were written in German and their name was spelled "Lindeschmidt." In 1801, Daniel's wife, Elizabeth (Weymer) died two months after the birth of their baby, Jacob. Joseph & Nancy took the child and raised him from infancy; Daniel remarried in 1802 and in 1803 moved to Columbiana County, Ohio, which was formed in March, 1803. Columbiana County history: In 1797 a few families moved across the Ohio and settled in the county limits. The first paper-mill in Ohio, and the second west of the Alleghenies, was erected in 1805-6 on Little Beaver creek, near its mouth, in Columbiana County. The Ohio Patriot newspaper, printed in New Lisbon, was established in 1808. In 1807 Joseph & Nancy also moved to Columbiana Co., Ohio along with sons John & Peter, and little grandson, Jacob. (Son Jacob & daughter Elizabeth moved there in 1810.) They probably traveled NW to Pittsburg, where they may have caught the Ohio River and floated about 50 miles to East Liverpool, disembarked and went 25 miles NW to Hanoverton twp. in Columbiana Co., Ohio. "Sept. 7 they arrived at the home of son Daniel, just opposite the junction of West Fork and Cold Run. They moved in covered wagons and lived in them until they could build log huts. At that time that part of Ohio had many bears, deer, wolves, wild turkeys and Indians" (from EWJ Lindesmith family history). "Each of the sons of Joseph received from the Government, free of cost, all the land they could clear and build their homes on at the end of 3 years. 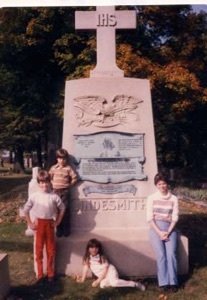 All 4 sons were in the War of 1812" (from EWJ Lindesmith family history). Joseph and Nancy lived the rest of their lives here in Hanoverton twp., Columbiana County, OH. Joseph died Jan 10, 1817 (age 66) (will); Nancy died Nov 24, 1836; 84 yrs (cemetery record: Oct 1836; 82 yrs). Both were buried in the Trinity Reformed Church cemetery, Hanover township, near Dungannon, Columbiana, Ohio with many other family members. In the St. Philip Neri cemetery near Dungannon a Lindesmith family memorial monument was erected by Daniel’s grandson, E.W.J. Lindesmith, with the early Lindesmith family names. Joseph is listed in the DAR Patriot Index. Pictured on left: Trinity Church Cemetery. The large monument is for Joseph & Nancy. This stone, which was placed there by his great-grandson EWJ Lindesmith, reads, "Great-great grandfather Joseph Lindesmith, died 1817, age 66. He was a soldier of the Revolution, bugler and fifer, served during the entire war, and was present at the surrender of Cornwallis." 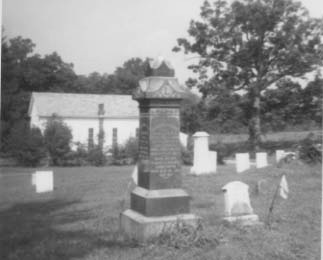 Pictured on right: the Lindesmith monument, with many names and dates on the back, located at St. Philip Neri Cemetery near Dungannon, Ohio. Daniel was born May 7, 1773, Pa, baptized the same day by Herr (Mr.) Deschler. He was listed on the census with his parents in 1800 in Somerset Co, PA. He married Feb 22, 1800 to Elizabeth Weimer (b 1779, daug of Jacob & Martha or Elizabeth Weimer) in the church in Berlin, Pa. Her father was not on the census of Brothers Valley twp in 1800, so perhaps they lived in another twp. They had one child, Jacob, and she died May 15, 1801 (age 22). She has a tombstone in Trinity Church cemetery in Columbiana Co., OH, but probably was buried in Somerset Co, PA because Daniel didn't move to Ohio until 1803. Dec 25, 1802 he m Gertrude Crissinger (b Dec 13, 1779; daug of Joseph & Rachel). In April 1803 they moved to Center township, Columbiana Co, Ohio, the first of the Lindesmith family to move to Ohio. Their home was known for generations as "The Stone House" on West Fork Creek, 5 miles west of Lisbon. He was in the cavalry in the War of 1812. Capt. Thomas Rowland came to Lisbon, Ohio in Columbiana Co, and raised a volunteer company soon after war was declared in Sept 1812. Capt Daniel Harbaugh had a company of light dragoons composed of Daniel Lindesmith & 51 others. Daniel is also listed (perhaps later) as a member of Capt Wm. Pritchard’s mounted company, 2nd rifle regiment of Lisbon, Ohio. He rode his own horse, carried his deer rifle, and played the fife and bugle, using the same bugle that his father had used during the Revolutionary War. 6. The right to Smooth the brow of care. 7. And whisper comfort, in despair. 8. The right to Watch the parting breath. 9. To soothe & cheer the bed of death. 12. And win the Lost from paths of shame. 14. The right the little ones to guide, in simple faith to him who died.
. . . Daniel William (m Sidney Ann Reish), both sons were in Civil War, Co F, 76th Ohio Vol. 1c) SUSANNA LINDESMITH, b 1804-10 (about 1807); m Nov 11, 1828, Columbiana Co, Oh to Patterson Copeland; children: John H., William K. (m Mary McCafferty), George F. (m Tamar G. McCurdy) These 1st 3 sons were in Civil War in Ohio Vol. Thomas, Joseph, Hannah, James J., Mary, Louisa C., Harruett G., Elizabeth, Isabek, Margaret A. 1e) SAMUEL LINDESMITH, b 1814; d Jan 7, 1888 (74 yrs), buried St. Philip Neri Cemetery. 1f) JOSEPH LINDESMITH, b May 17, 1816; m Feb 29, 1844, Columbiana Co, Oh to Mary Benner; 1850 lived in Centre twp, Columbiana. Co, Oh; d Oct 30, 1880, bur St Philip Neri Cemetery; children: Nancy (1846-1935), Henry B. (1848-1929; m Anna ? 1843-99, bur Trinity Cemetery), Sarah, Ann, Elizabeth, Lewis, Anna (1857-1935), Belle, Harvey, Gertrude. 2c) DANIEL KNEPPER, b 1797, Pa; m Elizabeth Kuntz May 27, 1819, Columbiana Co, OH; 1850 in Crawford Co, Oh; ch: William (1825), Jacob (1827), Joseph (1831), Elizabeth (1835), David (1837), Daniel Jr (1838), Henry (1842). Daniel Jr & Henry in Civil War from Ind. 4h) RACHEL LINDESMITH, b Dec 26, 1821; d Jan 3, 1902, unmarried, bur Trinity cemetery. 4i) JACOB LINDESMITH, b 1824; m Adessa (Hadessa) Copeland (d June 27, 1853); m 2nd Anna K. “Nancy” McKarns (1842-1928); 1850 in Hanover twp, Columbiana Co, Oh, lived with mother-in-law Mary Coplin. He was Justice of the Peace in Columbiana Co & member of the Presbyterian church; d 1891, Jacob, Nancy & Adessa bur Bethesda church cemetery, Franklin twp, Columbiana Co, Oh. Children: Ella & Bennie (twins of Nancy, buried with parents.
. . . Orlando Lindersmith, served in the Civil War in the 4th Minnesota Volunteers, was wounded at Vicksburg, and was in Sherman's "march to the sea." He m 1872, Ellen Thomson.
. . . Agnes Lindersmith, m 1877 to Matthew Titus Jepson in Fairboult, MN. I, Joseph Linasmith, of the county of Columbiana and state of Ohio, taking into view this shortness of human life and uncertainty of all things terestrial do make, ordain and establish this my last will and testament hereby revoking all former wills by me made. Item. My will is that my beloved wife, Nancy, should keep all my household goods of every kind and stocke during her natural lifetime and that my two sons Jacob and John should continue to furnish their mother with grain and other articles as agreed by the tenor of two several obligations given to each of them the one to Jacob, dated the 22nd of Sept., 1809, the other to John dated the 22nd of Sept., 1809, and that my wife also have the use, profit and advantage of any money that I may die possessed of. Item. My will and desire is that my sons and daughter fulfill, abide by and keep the contract herein before alluded to between myself, my wife and my two sons, Jacob and John—and that my executors, herein after named, make use of the necessary legal means to secure to them a good and valid title agreeable to the spirit and tenor of said obligations. Item. My will is that at the death of my beloved wife that our daughter, Elisabeth Keniper shall have and keep all my wife's clothes, wearing apparel, and linen of every kind. Item. My will is that at the decease of my wife all my property of every kind be divided into five equal parts and that each of my children namely, Daniel, Elisabeth, Jacob, John and Peter, receive each one equal share thereof. Item. My will is that as soon after my decease as conveniently may be, my tools of every kind be equially divided amongst my four sons. Confiding in the honesty and integrity of my son, Daniel Linasmith, I hereby nominate and appoint him sole executor of this my last will and testament, given under my hand and seal this 9th day of July, ano Domini, 1814. 1. 1800 Census, Somerset County, Pa.
15. History of Columbiana County (Ohio), by McCord, 1905, pp. 196, 311, 322, 329. 32. Births & Baptisms of Somerset County, Pa., manuscript copyright 1929 by E.C. Saylor. 40. Letter from Francis John Lindesmith in Ill. to John Downs in Ohio, 1860. 44. 1900 Missouri Census, Douglas County, Mo. 46. Gravestones, Mt. Ararat Cemetery, Douglas County, Mo. 52. Marriage record of Francis John Lindesmith and Elizabeth Momenteller, Apr. 16, 1839.